The ‘egg factory’ situated in the hen is an intricate mechanism that usually functions exceedingly well for the first couple of years before gradually slowing down in the mature hen. Occasionally there are hiccups in the ‘factory’ and it can produce double yolk eggs, along with many other egg abnormalities. The odds of a double yolk egg are around 1 in 1000. First, we are going to do a quick review of the hens’ reproductive tract just to remind ourselves of the anatomy involved and to marvel at how it produces an egg daily – usually without a hitch! Then we will look at egg laying anomalies such as double yolks, wind eggs and no shell eggs. It seems simplistic to describe the reproductive tract as a tube, but that is basically what it looks like. Although born with two ovaries, the right shrivels, leaving only the left ovary to produce eggs over the hen’s lifetime. 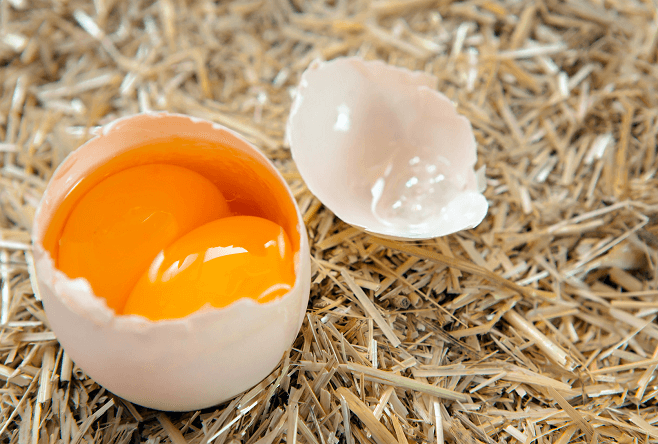 The ovary is packed full of ‘egg seeds’ (yolks) – more than enough for the hen’s laying period. The egg grows within the ovary and when ready slips down into the first part of the tube called the infundibulum – it looks a bit like a trumpet. The journey continues down the tube with varying amounts of time spent in special areas that add things like the chalazae (holds the yolk in place) and of course the shell, which is applied in the uterus. Once the shell is applied, the egg continues the short distance to the cloaca where it first sees the light of day when the hen lays the egg. All this happens in a time period of around twenty five to twenty seven hours. Another yolk will be released from the ovary between thirty to seventy minutes after laying that egg. ‘Hiccups’ can occur at any point in the process and some hens are more prone to problems than others. Let’s take a look at one of the ‘best’ hiccups that can occur: the double yolker! 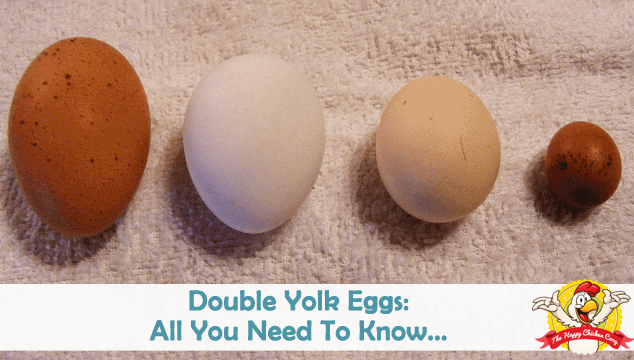 Double yolks are fairly uncommon, around one in one thousand eggs will be a double yolk. Triple yolks are exceedingly rare, but not unknown! What happens is that a yolk is released and then another is released within a couple of hours. These two yolks get encased in one shell. Needless to say, this is a large egg which can cause problems like egg binding. Fortunately, most hens seem to manage to lay these monster eggs without mishaps. The issue can be hereditary, but it is most common in production pullets just coming into lay and occasionally older layers coming to the end of their cycle. The younger pullets coming into lay are suffering from hormone change and imbalance which can cause the double yolk phenomenon. Once they have settled into their routine laying pattern, double yolks should disappear and be replaced by regular eggs. If you were to buy your eggs from the supermarket here in the US, you would never see a double yolk egg – they are considered ‘imperfections’ by the industry. In the UK by contrast, it is possible to find them in the supermarket. If you were wondering is it possible to hatch out a double yolk egg, the answer is usually not, although it has happened. If they do hatch, one chick usually succumbs since the amount of oxygen inside the shell is limited and the stronger chick will survive. There are very rare instances of both chicks hatching, but no follow up information on how they thrive. Now we’ve covered double yolkers, let’s take a closer look at other egg anomalies. Imagine you crack open your egg to reveal…another egg! These are fairly rare events fortunately. No one quite knows why this happens – the completed egg suddenly changes direction, reverses back to the uterus where it receives an albumin coating plus another shell. Very occasionally, the reversed egg will bump into the next egg on the ‘conveyor belt’ and another shell will be laid over both eggs! Needless to say the egg will be large so the hen is not to be envied trying to lay that egg. Although strange, the egg within is safe to eat. These are also known as fairy, or witch eggs because of their size. In times gone by they would have been known as rooster eggs which were an evil manifestation. People believed these eggs were laid by the rooster and if the egg was allowed to hatch the creature issuing from it was called a cockatrice. A cockatrice could turn people to stone if they looked upon it, so the egg had to be thrown over the roof of the house without touching the house to prevent the birth of such a creature! In actuality a wind egg is usually produced by young pullets coming into lay and having hormonal adjustments. They can have a teeny yolk, but many are yolkless. Older hens can also lay fart eggs – usually if they have suffered some disturbance in their routine (new flock mates, change of feed etc). These eggs are harmless and normal service will be resumed as soon as the hen pulls it all together! Bumpy, irregularly surfaced, or gritty surfaced shells that feel like sandpaper are caused by uneven distribution of calcium across the shell. There can be a few causes of this harmless appearance, the incidence being higher in hens that lay early in their lives. Defective shell gland – not much can be done to correct this, it is an internal problem of the hen although it may sort itself out over time in new layers. Water shortage – can occur in summer when the drinkers run dry, or more commonly in winter when the drinkers freeze over limiting access to water. Sudden lighting changes – any change in the lighting for the hens needs to be done gradually. Disease – Infectious Bronchitis or Infectious Larngo-Tracheitis can cause this too. Although the virus causes primarily respiratory problems, it can cause infections in the reproductive tract also. These eggs are fine to eat – if you suspect infection in your hens, err on the side of caution and toss them. The shell in these eggs can be super thin, leading to a parchment look to the shell, or the egg is laid with only the outer membrane and no shell at all! Younger hens can produce them while they are coming into regular lay. It should settle down when her hormones are balanced out. 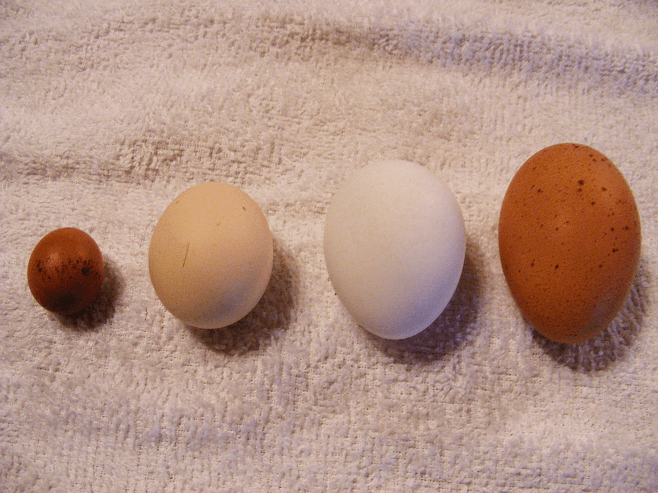 Older hens, especially good production layers are more prone to soft or shell-less eggs. The cause is not really known. Hot days – hens tend to reduce food intake when it’s hot thereby reducing the amount of calcium they take in. The problem usually resolves when cooler weather arrives. Poor diet – a diet lacking calcium, vitamin D and/or protein will increase the likelihood of shell problems. Always feed a fully balanced diet to your hens. Old age – happens to us all and things don’t work as they should! No known cure. Obesity – corpulent hens do not lay as well as their more svelte sisters and suffer from more egg laying problems also. Calcium absorption problem – a genetic problem with no known cure at this time. The calcium that a hen eats cannot be absorbed by her body leading to egg problems and bone trouble also. Inflammation of the oviduct – also known as salpingitis. This is a very serious problem caused by a viral or bacterial infection. The only effective treatment is antibiotics and some birds may respond well to the antibiotics, others will succumb to the infection. These affected hens will sometimes lay what is known as a ‘lash’ egg. It is not an egg but an encased ball of pus and tissue that have passed through the oviduct. Blood spots occur inside the shell. When you crack an egg the yolk can be lightly blood tinged. This is nothing to panic about. A small blood vessel around the yolk burst and leaked out a minute amount of blood. This may not be attractive, but the egg is fine to eat. I use them in baking all the time. Meat spots are brown in color and usually very tiny. It is actually a particle of the hen’s reproductive tract which has detached and become incorporated in the egg as it passes by. Again, these are safe to eat as long as it is cooked. 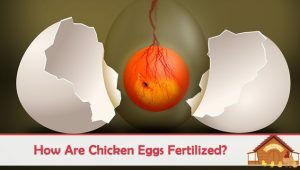 The reproductive system of the hen is pretty much in constant motion – from releasing the yolk to building and laying the egg. The cycle is repeated daily so occasionally there is a malfunction. We have talked about several different ‘oddities’ in eggs today. Although some of the more unusual eggs can be caused by disease that is usually the exception rather than the norm. As hens are generally living longer than their ancestors some of the problems associated with ‘old age’ and extended laying years are poorly researched. Traditionally old hens went into the pot as soon as production dropped. This is still true for ‘industrial’ hens, but our backyard ladies are living well into their dotage now. If you are concerned about the frequency of odd occurrences in your flock, do a mental check list to try to eliminate some possible causes. Was the weather very hot over the last few days? Were the hens deprived of water because the water froze in the drinker? Has there been a stressful event for them? Did I change their food? How young/old are they? 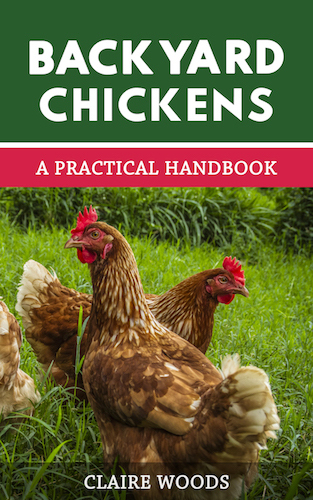 If you can rule out all of the environmental factors that might contribute to a problem, then it’s time to start looking carefully at the hens. Is there sneezing, coughing among them? Does any particular hen look unwell? Can you actually pinpoint the one who lays the oddities? If you are able to find the hen who lays the problem egg check her over thoroughly for any signs of illness or disease. If you are concerned about her health you can isolate her for a few days and see what happens. If you suspect something like salpingitis or infectious bronchitis you should take her to the vet for a check over. The vast majority of the oddities we have talked about are not unusual and can occur at any time, especially if your hens are stressed. The chances of her having a serious problem are small and uncommon, although infection and genetic issues can arise. So, the next time you get an ‘oddity’ you can use this article to help you try to understand what’s going on! I have 32 hens and only get maybe 12 eggs a day 3 hens are broody why don’t I get more eggs? I have found that when my hens go broody, there are always a couple of others that ‘get sympathetic’ and stop laying too! Are you able to separate the broodies from the main flock? Also check for secret stashes. We have a Leghorn that will lay jumbo eggs every third lay. My husband and I were flabbergasted! They are indeed double Yolkers and largest weighed 97 grams. The eggs are delicious and we feel it’s a treat to get one, but it’s a wonder how our Leghorn passed such a jumbo egg!! We have had a small number (6/8) hens over the years. At present we have six, – 2 Loman browns, 2 Scottish blue bells, and 2 white leghorns, all been laying for 4 months, all was well. However about 6 weeks ago the leghorns started laying eggs with very very pale yolks, just off white why? All hens have same food are freerange and are a wee bit flighty. What might be the cause. FYI – I have an isa brown that regularly lays eggs weighing over 100g and quite often they are double yolkers. She is not any bigger than the other Isa brown I have. I have 48 hens, and this year alone I’ve gotten 14 double yolkers, incl the friends I’ve given a few eggs to. An octogenarian friend got his first ever! Thank you for an excellent timely article. My two, a BS*xL and a BPR are laying daily. They are 1.5 yrs old. Last week the temperature went dramatically up and I got a monster egg. BSL laid it and her eggs usually weigh 65-70 grams, this one was 120 grams. I was worried but nothing seems to have changed and she keeps laying normally. I have two isa browns my first ever, the larger one seems like she is laying a reasonable size egg but her friend who is smaller doesn’t seem to be laying. What could be the cause? plus we are getting double yokers a lot they are small yolks though. they are both about 24 weeks. They are both so young I wouldn’t worry too much. Give them until 30 weeks old to get into the swing of things! The rooster won’t be causing them not to lay eggs. What are you feeding them and do they have access to 12+ hours of daylight? I have 4 Rhode Island Reds and 5 Black Barred. 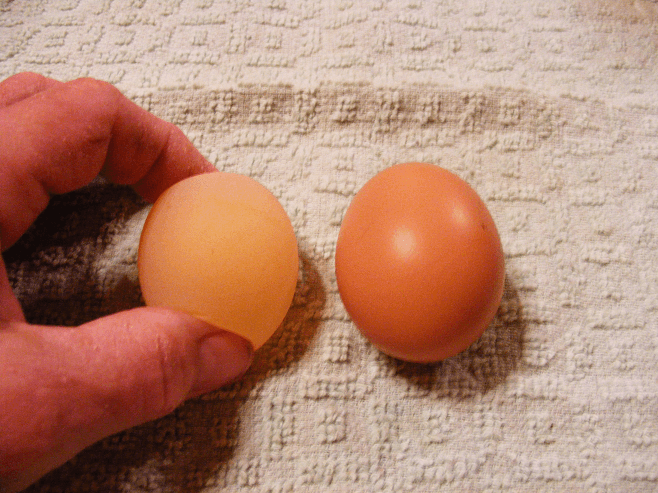 I have 1 that quite often lays a shell less egg, and another that lays a very large egg. Also many of the eggs have very watery whites. They free range in a large yard and I feed them layer feed, calcium supplement and appropriate table scraps. They are in their 2nd year and seem healthy and content. Any thoughts about the watery whites? We have 4 hens. All less than a year old and they just recently started laying. One of the hens lays a double yolk egg every day. I just cracked three double yolkers in a row!! Eggs are crazy! I have been buying locally produced eggs from a cage free farm…no antibiotics, but not organic. The past three dozens have had double yolks in all of them. I love them, but I am just concerned if they are all safe to eat. They are the tastiest eggs and I love the extra yolk.